Going back to my recent trip, as I mentioned one of the highlights of this visit was the food event called #KLiteFoodies, Foodies at the Hub. A weekend market and food festival happened in Baguio City last April 17-18 brought to us by Baguio-AyalaLand TechnoHub and John Hay Business Club in partnership with Azalea Residences, University of Baguio, Manila Bulletin and Sun Star Baguio. 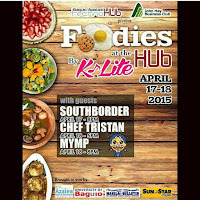 The food event was participated by more than 15 restaurants and foodies mostly residents of Baguio. In Manila, I've attended several food crawls and food events of this kind. Because Filipinos are talented, they can create, modify and give twists to any regular dish. This blog post will increase your appetite and hopefully make you decide to include going to Baguio this summer. Are you ready? The pine trees provided shades to cool the summer heat. It's so refreshing to dine and set a family picnic at Camp John Hay. It was in 2009 when I first set foot in this place. I was looking for Tsokolate Batirol then. He started experimenting in the kitchen at age 12, Joaquin Antonio Migallos level up his skills and knowledge with extensive training from the Center for Culinary Arts. The love of food and flavors lead him to create SPREAD. We got some sweet treats from the G and C cafe. I tried their soft and creamy Cheesecake. The chili chocolate cupcake and carrot cupcakes looks enticing. I still can't get over Jovy's strawberry adobo. It's very flavorful, the meat was tender and juicy. I asked her what's the secret and she said "I'm using strawberry". I've heard a lot of twists in making adobo, there's adobo sa puti, three-way adobo. Our family cooked it two-way, simmer until there's small amount of sauce left in it. Then we sauteed in onion and add the remaining sauce. Jovy's adobo is another unique and outstanding adobo version. I promised myself to try it at home unfortunately we were not able to bring home Baguio strawberries. Meet the blockbuster that day. From morning until the afternoon, there's a long queue at P99 sandwich was the crowd's favorite. When in Baguio or else where in the Philippines, I make sure to buy something that will remind me of my trip. It may be a kitchen aid, home decor, clothes or personal care item. I took a break and went around to see other Baguio products. There were pasalubong items from Lengue De Gato, Peanut Brittle, Strawberry and Ube Jam, native bags and footwear even Igorot costumes. These two cute tissue holders caught my attention. I was tempted to get one even if I already have one which I bought in 2009. Walking under the shade of pine trees, I found this store selling pashminas. Oh I love scarfs! I bought this knitted pashmina for only P150. I also spotted Baguio's Best Choice Strawberry Jam and Peanut Butter. I tried Okonomiyaki from different Japanese restaurant, too bad we were not able to try Ninja Pancake. I wonder how it taste. We had dimsum, chicken feet at Kung Fu Kitchen. Some of my blogger friends were quite hesitant to try chicken feet. It was okay with me, my mom's side of family cooks adobo chicken feet. My favorite from Kung Fu Kitchen is the wrapped bacon and spare ribs. It was past dinner time when I realized I was munchin on these yummy Pepperoni, Cheese and fries. 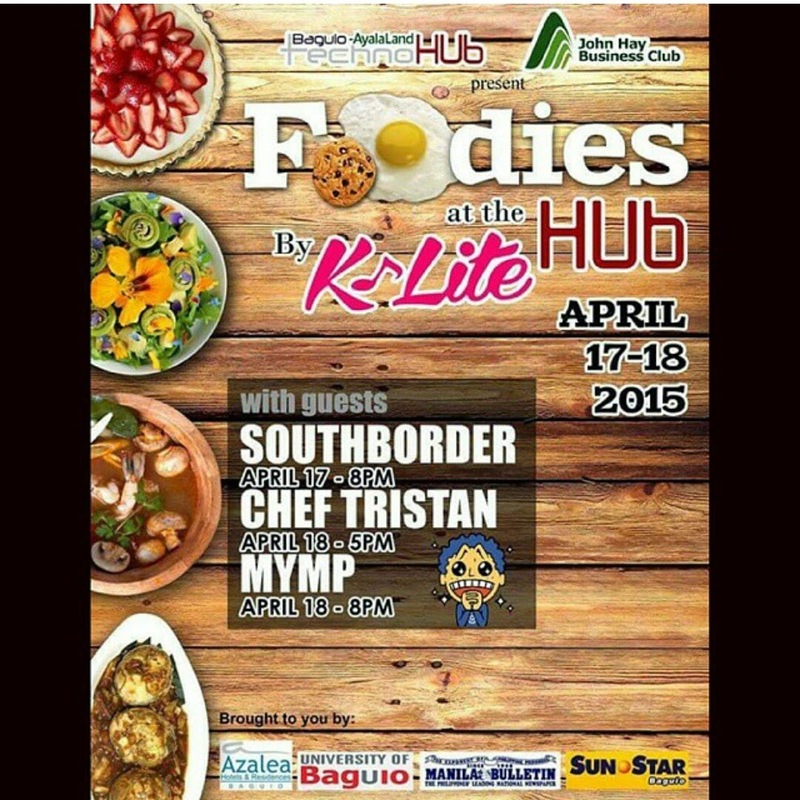 There goes my Lakbay Baguio Top 6 Foodies at the Hub! I must say it was a successful weekend food festival. Cleanliness and orderliness were maintained. I didn't saw any bottled water or BBQ stick around. There were trash bags in every food stalls and around the area. People did not mind the cold weather and frequent rain showers especially in the evening. Congratulations #KLiteFoodies #FoodiesAtTheHub! Have you been to Baguio lately? How was your experience? I hope you would include the summer capital of the Philippines in your summer getaway.